^ a b About the J. Paul Getty Trust.. Retrieved August 15, 2008. ^ a b Schultz, Patricia (2003). One thousand places to see before you die. Workman Publishing. p. 575. ISBN 9780761104841. http://books.google.com/books?id=JeLyE5ada5gC&pg=PA575&dq=Getty+Villa&hl=en&ei=PqRzTfT2I5K4sAP0lpi3Cw&sa=X&oi=book_result&ct=result&resnum=8&ved=0CFAQ6AEwBzge#v=onepage&q=Getty%20Villa&f=false. ^ Greenberg, Mark (December 2005). 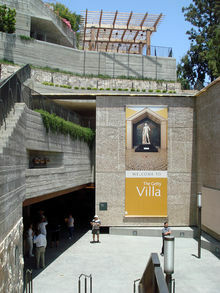 Guide to the Getty Villa. Getty Trust. p. 131. ISBN 9780892368280. ^ Baedeker, Rob. アメリカ合衆国の美術館入場者数 上位25箇所 ForbesTraveler.com, 2007/09/21.Retrieved 2011/07/10. ^ Art on View (Visit the Getty). Retrieved August 22, 2008. ^ Wyatt, Edward. Getty Museum buys a seldom-exhibited Gauguin. New York Times, March 12, 2008. Retrieved August 26, 2008. ^ J. Paul Getty Museum. Arii Matamoe (The Royal End). Retrieved August 26, 2008. ^ Kimmelman, Michael. Getty buys van Gogh "Irises," but won't tell price. New York Times, March 22, 1990. Retrieved August 26, 2008. 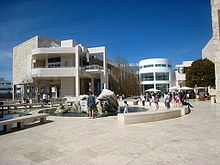 ^ J. Paul Getty Museum. Portrait of a Halberdier (Francesco Guardi?). Retrieved August 26, 2008. ^ Reif, Rita. Old Master auctioned for record $35 million. New York Times, June 1, 1989. Retrieved August 26, 2008. ^ Men's Vogue, Nov/Dec 2006, Vol. 2, No. 3, pg. 46. ^ Slayman, Andrew (May/June 1999). “Getty Returns Italian Artifacts”. Archaeology 52 (3). http://www.archaeology.org/9905/newsbriefs/getty.html. Getty Villa construction records, 1960, 1964, 1968-1986, undated (bulk 1971-1974) The Getty Research Institute, Los Angeles, California. Correspondence, reports from the architects and builders, legal and financial documents, blueprints and models, photos, printed matter and oral histories, dating 1960, 1964, 1968–1986, undated (bulk 1971-1974) concern the design and construction of the J. Paul Getty Museum (Villa). Guest scholar and conservator files, 1978-2005 The Getty Research Institute, Los Angeles, California. The records comprise files relating to J. Paul Getty Museum guest scholars, visiting conservators and general program files, dating 1978-1996, in addition to photograph albums dating 1979-2005. Library Inventory and accession records, 1954-1965, 1977 The Getty Research Institute, Los Angeles, California. The records comprise inventories, lists, and accession records from the museum and library, listing J. Paul Getty's personal books and furniture in the museum, reference books in the library, and books purchased for the library of the J. Paul Getty Museum, from 1954 to 1965, and 1977. Records, 1975-1999 The Getty Research Institute, Los Angeles, California. These records were generated by the J. Paul Getty Trust Publications offices and departments and its related Editorial Committee during the course of day-to-day operations. Registrar correspondence, 1973-1975 The Getty Research Institute, Los Angeles, California. The records comprise internal and external correspondence from Pamela Wiget, Registrar of the J. Paul Getty Museum from 1973-1975.